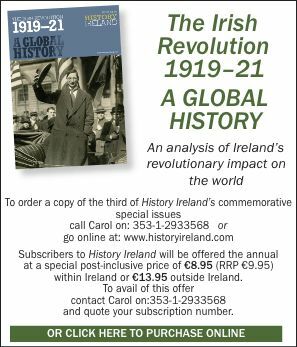 We recently devoted a good deal of attention to the Irish involvement in the First World War, and one rather obvious reason why ostentatious commemoration of the Irish war provokes unease and hostility relates to the questionable nature of British policy in Ireland, and the role of British security forces. This is nothing new: when the formal victory parade to mark the end of the Great War was held in Dublin in July 1919, it was attended by 5,000 ex-servicemen; but a few days earlier 3,000 members of the ‘Irish Nationalist Veterans Association’ had held a rally at the Mansion House where they had resolved to boycott the victory parade to register their opposition to a government that was intent, as they put it, on ‘the coercion of this country’. The recent episode of BBC’s Panorama dealing with the actions of an undercover British Army unit known as the Military Reaction Force (MRF), provided damning proof of what ‘coercion’ might consist of on the streets of Belfast in the early 1970s, . This took place on the watch of Brigadier-General Frank Kitson, a man with ample experience of putting manners on the natives across the remnants of the British Empire; and both the underlying mentality and the methods used to do this were imported to Belfast in the early 1970s with horrendous results. The MRF practiced an unofficial shoot to kill policy, and did not seem particularly fussy about who they shot. A compelling range of testimony was presented here from former members of the unit in question, former members of the RUC and British Army (who should be given credit for appearing here), republicans, journalists, victims of the MRF, and relatives of their victims who did not survive. For the key allegation was that the unit killed a number of unarmed civilians who had been assumed – without any corroborating evidence – to be republican paramilitaries. The former members of the MRF interviewed by the BBC openly stated that their role was as a ‘terror’ force, that they had no compunction breaking the British Army’s own regulations on lethal force, and that they would do it all again if need be. A standard means of defending such conduct is to argue that it had to be done, and to point out that the IRA were also indiscriminate. But this ignores the fact that these killers were not paramilitaries: they were supposed to be the forces of law and order, and should surely be held to a higher standard. The image of undercover British soldiers carrying out quite random drive-by shootings with Thompson submachine guns that could not be traced back to them is a shocking one. The BBC should be commended for an overdue expose: this was a rare glimpse of the depths to which the British state could sink. It also focuses attention on the early years of the ‘Troubles’. While the records of the MRF are long since destroyed – funnily enough – a great deal of source material still survives, and on 28 November the National Archives of Ireland released the second batch of its records that are to be hosted on the University of Ulster’s CAIN (Conflict Archive on the Internet) database. Last year, 100 documents from the NAI, dealing with the years 1965-69, were added to the database (which already has extensive material from PRONI). Another 750 items were added from 1970-74, dealing with the ‘Arms Crisis’, internment, Bloody Friday, Bloody Sunday, Sunningdale, the 1974 Ulster Workers Strike, and much more. These are Irish official records, and as such cast light on how Northern Ireland and the outbreak of the ‘Troubles’ were viewed from Dublin. All were available under the ‘30 year’ rule, and the documents have been digitized and can be downloaded. No doubt there are many more to come (and plenty that have been squirreled away), but given the ongoing question of how the legacy of the past is to be dealt with in relation to the ‘Troubles’, any disclosure of records, no matter how modest, is surely to be welcomed. The CAIN database has become an invaluable resource in recent times, and these files add a small piece to an extensive and illuminating jigsaw that is well worth exploring. To visit the CAIN database, click here.